While most were tuned into their TV to see Prince Harry tie the knot, another very special event was happening here at TCR- the Un-Royal Wedding, and the debut of TCR's homemade Hooch Hauler. The Hooch Hauler (www.hoochhauler.com) is a re-purposed horse trailer, that now functions as a mobile bar. The bride and groom wanted a special bar for their wedding. The groom, wanting to do something nice for his sweetie, said "I can build you one," and found the perfect old rusted out horse trailer abandoned on the ranch property. With (LOTS) of help of his father, brother, and TCR's ranch manager, the Hooch Hauler came to life. Needless to say it was quite popular among the wedding guests. With its beer taps, refrigerators, freezers and ample booze storage it was the focal point of the party. Singer Songwriter Maddie Leigh performs the Dolly Parton classic "Coat of Many Colors," on the Gazebo Stage at the Temecula Valley Bluegrass Festival Sunday, March 25. Named Female Entertainer of the Year at the West Coast Country Music Association Music Awards in 2016, Leigh is scheduled to open for Tucker Beathard and Jason Aldean at the Oregon Jamboree Festival in August. ​The three-day event, held March 23-25, brought together a variety of acts and music lovers from throughout the southwestern portion of the United States for a fun weekend of music, food and camaraderie, all to raise funds for the Moyer Entertainment Group's music education programs. "Temecula Valley is unique in that its music community bands together to support, encourage and share its resources with one another on all levels," Moyer Entertainment Group founder Tim Moyer said. "MEG raises funds that go directly to local school music programs as well as personal scholarships for gifted hardworking music students in need through music events including the Temecula Valley Bluegrass Festival, Temecula Valley Music Awards and more." Two stages presented a round-robin style event featuring nearly three dozen artists who entertained the crowd with their unique musical stylings. Workshops were also held throughout the weekend. For more information on the Temecula Valley Bluegrass Festival and Moyer Entertainment Group, visit http://www.Temeculabluegrass.com or http://www.TVMAwards.org. Kim Harris can be reached by sending an email to valleyeditor@reedermedia.com. Bluegrass Festival back at TCR! 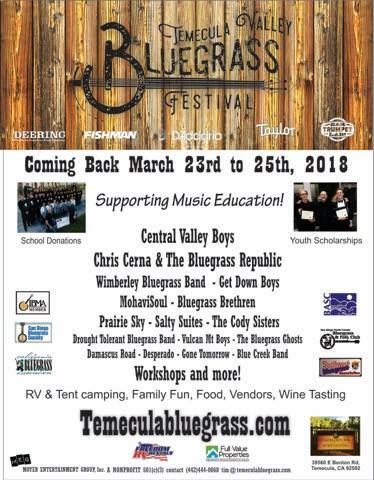 Tucalota Creek Ranch and TCR Cellars is excited to once again be selected as the venue for this Awesome event, the Temecula Valley Bluegrass Festival March 23-25, 2018. This is great music festival covering a wide genre of america music: Bluegrass, Folk, Americana, Rock, etc. The line up is growing and we've already confirmed these amazing acts: Central Valley Boys, Chris Cerna & Bluegrass Republic, Get Down Boys, Wimberley Bluegrass Band, Bluegrass Brethren, Salty Suites, The Bluegrass Ghosts, Damascus Road, Sweet Tidings, Desperado, Prairie Sky, MohaviSoul, The Cody Sisters, Grasslands, and more! Live Music, Food, Beer, Wine, and good times all one of the SoCal's premier ranch facilities. See you there! 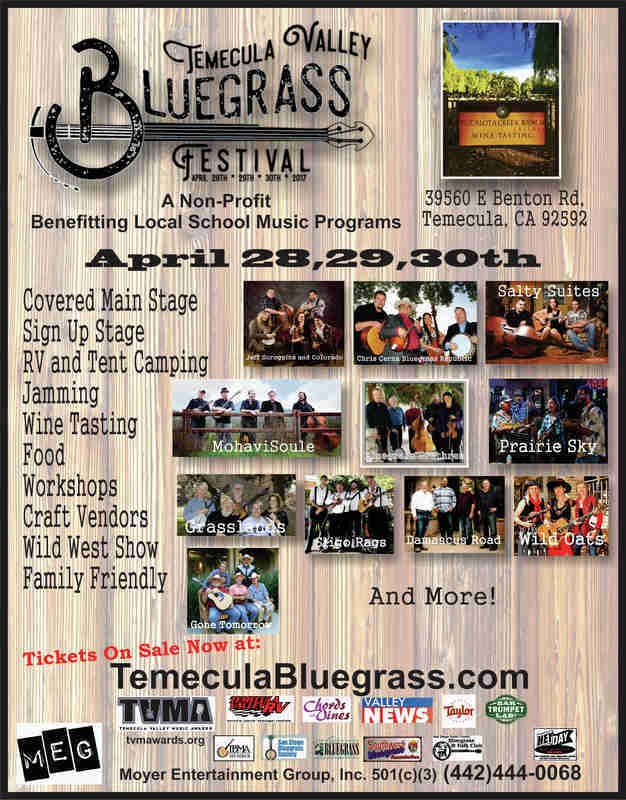 The return of the annual Temecula Valley Bluegrass Festival this past weekend brought some of the top bluegrass bands in the nation to the rustic Tucalota Creek Ranch all to benefit local school music programs and music student scholarships. “This was just what we expected,” Tim Moyer of Moyer Entertainment Group, said. “We saw nearly 1,000 visitors come and enjoy the intimate festival that was enjoyable in a very easy way at the ranch. And this time it was all for nonprofit causes.” Moyer Entertainment Group organized the comeback of the Temecula Bluegrass Festival which was dropped from the city of Temecula’s calendar last year. The event made the sounds of bluegrass music, country gospel and traditional country music ring even truer to the tradition of early America to some visitors who camped right next to corrals housing some of the top world western cutting, dressage and running horses being trained by internationally known trainers. Tucalota Creek Ranch owners Kay and Alan Needle and son Josh were pleased with the special event at their 22-acre, professional horse training ranch and their by-invitation only TCR Cellars winery at 39560 Benton Road outside of Temecula. Alan Needle said they hope to work with Moyer on other special events at the ranch. Mark your calendars for April 30th from noon-4:00p for the next TCR Cellar's Wine Club Event. We have a few special things planned for you. 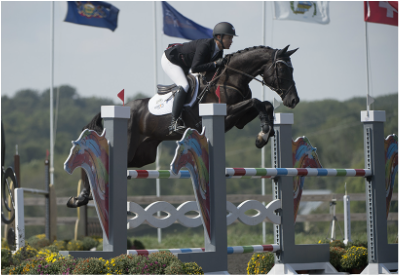 We are introducing our new wine, Mai Baum Malbec, featuring our own 3 day Eventing Trainer, Tamie Smith and the horse she is fortunate to have teamed up with, Mai Baum (known to us in the barn as Lexus). As usual, wine tasting or a glass of wine is complimentary to our wine club members. 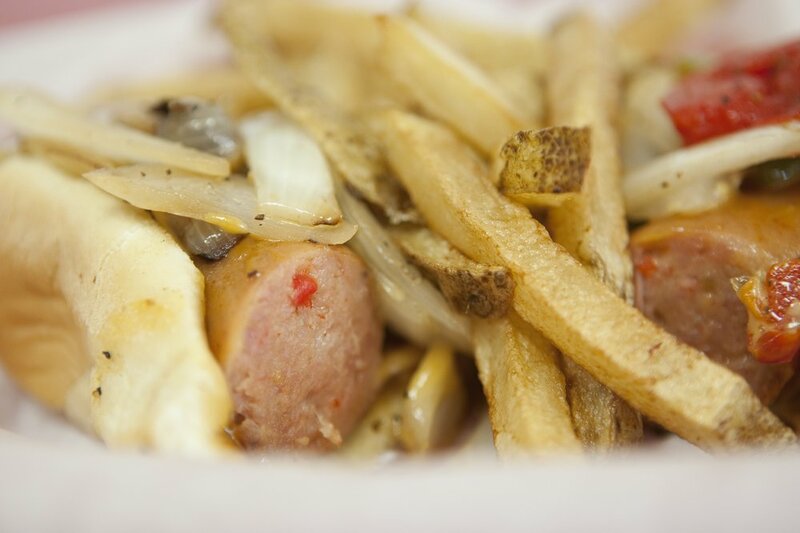 The sausage tasting is only $5.00; we are confident you are going to enjoy as we did. We also welcome Mad Mike’s club members to do a wine tasting for only $5.00 as well. 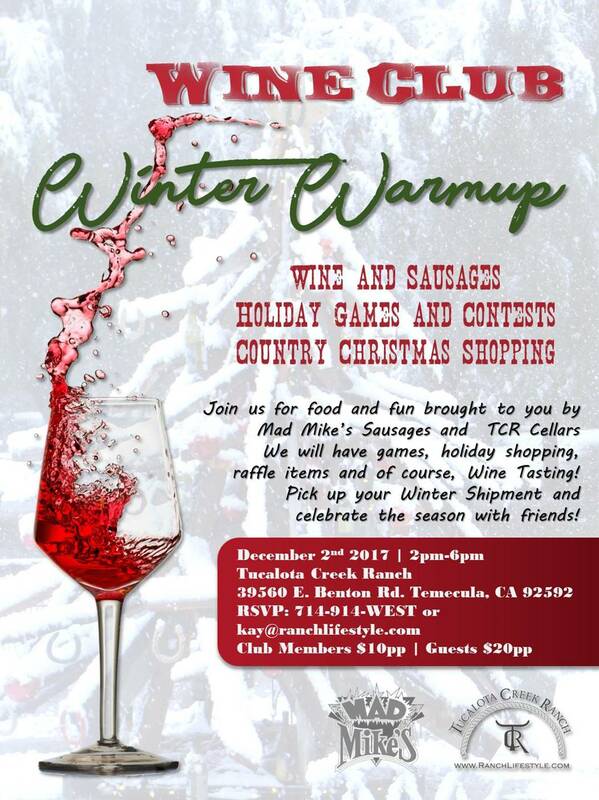 Guests are welcome and may enjoy both tastings for $15.00. Please RSVP by email or Call/Text 714-914-9378 by Monday, April 25, so we can make sure Mike can plan for us all. We at TCR feel very fortunate and proud to have been a part of the PEDAL The Cause ride, 2015. Over 300 riders made the 75 mile trek to the Ranch to enjoy an afternoon of music, food, and camaraderie. They spent the night at Camp PEDALton only to get up early next morning to ride back to San Diego. They did it all in support of a World Without Cancer. You can find out more about Pedal the Cause San Diego here. Hosting an event like this at TCR was a pleasure. How could our venue work for your next event? Happy Summertime TCR Cellars Wine Club Members! 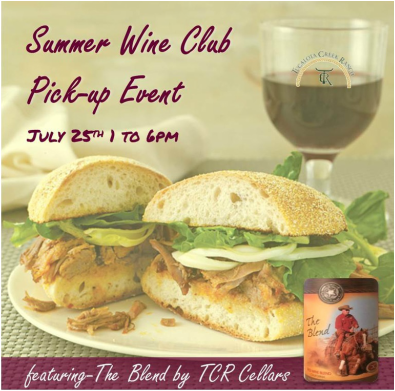 We invite you to join us on Saturday, July 25 starting at 1:00 pm for the summer Wine Club Member Pick-Up. We are providing a pork slider lunch for you to snack on while you enjoy our ranch and a glass of our new wine, THE BLEND. The summer Club wines are the 7X Rhone style, and The Blend- a central coast red blend. This wine, blended with Cabernet Sauvignon, Zinfandel, and Syrah is a delightful wine that is fruit forward and medium-light body, making it a great summer red. The 7X will go great with your next steak or pasta dinner. Please RSVP by the 19th so we can plan the food!!! RSVP to Kay at 714-914-9378 or send us an email. Sure hope you can join us!